When it comes to this whole “subs not dubs” thing when it comes to anime, I’ve got to be perfectly honest; I would much rather understand the dialogue rather than spend half my time reading the bottom of the screen, missing the beautiful animation in the process. That’s why, whenever there’s a new anime film out for me to see, I will always try as hard as I can to see an English-language version over the original Japanese one, because I’ve tried watching anime films in their initial format and every time I have struggled to keep up with both what was happening in the story and what kind of visuals were being thrown my way (I struggled to get through films like Akira and the original Ghost in the Shell for that very reason). With that said, this review for Mary and the Witch’s Flower, the first feature-length production from new anime company Studio Ponoc, is strictly for the English dub, and honesty it’s the one I’d recommend the most for younger audiences, because it goes perfectly along with how this story, its characters, the dialogue etc is all very much intended for children, and in that regard it’s a fine piece of work indeed. Set in the English countryside, a young girl named Mary (voiced by Ruby Barnhill in the English version) is temporarily staying with her Great Aunt Charlotte (Lynda Baron) until her parents arrive. She is bored senseless, but things begin to get interesting when she finds a rare “fly-by-night” flower in the woods that grants magical powers, and once she also comes across a broomstick hidden within the roots of a tree, it springs to life and transports her up to the clouds and to the Endor College for young witches. There, she is greeted by the headmistress Madame Mumblechook (Kate Winslet) who invites her to experiment with her magic, but soon shows a more sinister side when she learns of the flower, and it’s now up to Mary to try and save the day when Mumblechook holds local boy Peter (Louis Ashbourne Serkis) captive in exchange for what remains of the fly-by-night. This is the first film by Studio Ponoc, a new anime studio formed by several former animators from Studio Ghibli, which is currently going through a production hiatus in the wake of founder Hayao Miyazaki’s retirement, and you can certainly see similar traits from the wildly imaginative visuals that heavily highlight the fantastical elements, to the simple but likeable characters it lets you follow. 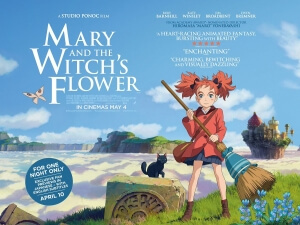 If you’re going into this expecting a story that’s about as emotionally rich and complex as some of Ghibli’s films, however, chances are you’ll probably come out a little disappointed, because the overall plots and themes of Mary and the Witch’s Flower – itself based on the children’s novel The Little Broomstick by Mary Stewart – are simplistic to a fault, which may try the patience of older and more thoughtful audience members, but for young children is honestly kind of perfect. I can see little kids really liking this movie, not just for the pretty colours but also for the sweet-natured lead character and the fun and creative world that the filmmakers have made, and if anything it’s a great film to introduce them to and potentially kick-start a keener interest in the works of Ghibli, among other equally-enchanting anime worlds. I certainly plan on showing this to my seven-year-old goddaughter, who I was constantly thinking about while watching this because it’s just the right pace, mood and suspense that seems practically tailor-made for someone of that age, and I anticipate that she will enjoy this very much. From my perspective, even though this was clearly not made for my age demographic, I still thought this was a solid children’s film that has its charms, especially in its animation which is, of course, absolutely wonderful to witness. Again, you can tell this was made by people with previous experience at Studio Ghibli because everything from the water to the clouds to the quiet atmospheric shots are lovingly crafted to flow smoothly and sufficiently, all while never becoming too in-your-face and instead stepping back to let this wondrous environment sink in. The characterisation may be thin in some parts, and again at times it can be a little too simplistic to a point where it starts to become more predictable and overly kid-friendly, but these are still charming and likeable characters that you’re following, and the story is definitely interesting enough to keep your interest. In that regard, I hesitate to compare it too much to Harry Potter, which was another story about a young magician who ends up going to magic school, because the book that this movie is based on was released in 1971, decades before JK Rowling even began thinking about her revolutionary series – that being said, thoughts of Hogwarts did enter my mind regularly during this, but only because Harry Potter is a way more mainstream source than Mary Stewart’s book is, and overall it does enough different things to separate itself from the inevitable comparison as much as possible. As Studio Ghibli takes a break for the time being, we now have Studio Ponoc to hopefully fill the gap until it comes back, and with Mary and the Witch’s Flower they’ve so far proven that they’re just as competent with storytelling, albeit on a much more basic level, as its immediate predecessor. Mary and the Witch’s Flower is a perfectly solid children’s film filled with whimsy and charm that should delight younger children, although some older audiences may be frustrated by its overall simplicity in comparison to other films like it.